“No need to worry, I’ll be home soon, ’cause I’m rockin’ with the boys,” Frehley sings on “Rockin’ With the Boys,” which tells the tale of life on the road. Ace says he wrote the original version of the song back in KISS’s heyday in the ’70s. Both “Rockin With The Boys” and “Bronx Boy” are available on all streaming platforms today, and are iTunes instant grat tracks for fans who preorder the album. 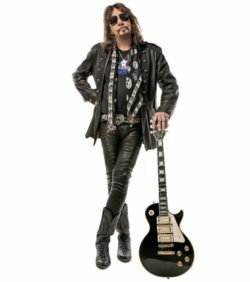 The original Space Man himself Ace Frehley landed in Binghamton, NY on September 24th to perform at the Magic City Music Hall. The Rock and Roll Hall of Famer is out in support of his most recent studio release titled “Origins Vol. 1” a collection of covers handpicked by Ace himself. Though Ace had not performed in the Binghamton area since 2000 the Broome County fans certainly hadn’t forget about the man from Jendel. Starting of the night were the blues tinged jam band Simo. Hailing from Nashville, TN the group performed a writhing 35 minute set which helped get the night underway. Front man JD Simo didn’t waste much time interacting with the crowd as he and his band mates let the music do the talking. The power trio all seemed quite well versed in their instrumentation as each song the band performed featured lengthy solo areas that each member filled in with ease. The band closed out the set with an energetic rendition of Joe Cockers “A Little Help From My Friends” which easily garnered the largest applause from the assembled crowd. After a momentary set change Ace Frehley and his band would hit the stage as echoes of Ace’s song “Fractured Mirror” played over the PA system. The band kicked off the night with “Rip It Out” from Frehley’s 1978 solo album setting the tone for the night’s adventure. The set touched on almost all of Ace’s solo works as wells as some of the material he wrote during his days with Kiss including “Parasite”, “Rocket Ride” and “Strange Ways” which features bassist Chris Wyse on vocals. Another highlight of the nights was “2 Young 2 Die” from Ace’s “Trouble Walkin’” album featuring guitarist Richie Scarlett on vocals. Despite a few out of key moments and a couple tempo issues the band still put on a solid performance which the audience in Binghamton seemed to really enjoy. With the chances of Ace returning to Kiss growing slimmer and slimmer with each passing day the 65 year guitarist is showing no signs of slowing down anytime soon as a solo artist, Nor should he as he is still able to get up on stage and put on an entertaining show night after night. There are still just a few more chances to catch Ace this year so if he is coming to your town or one nearby I highly recommend you get yourself a ticket as soon as possible. 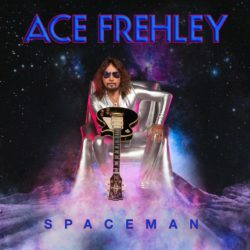 Original Kiss guitarist and recent Rock and Roll Hall Fame inductee Ace Frehley is back with a brand new full length studio album appropriately titled “Space Invader”. The album is being released via eOne Entertainment and features 11 brand new tracks along with Frehley’s beefed up rendition of the Steve Miller Band classic “The Joker”. Over the past few years Ace has seemed to have gone through a period of career revitalization. First was the release of “Anomaly” in 2009, which was Frehley’s first solo release in over 20 years. Shortly after that was the release of his first autobiography titled “No Regrets” and of course we all know about the controversy surrounding Kiss’s induction into the Rock and Roll Hall of Fame. This brings us to Frehley’s newest musical offering “Space Invader”. The album takes a much grittier approach than Ace’s previous release yet is still classic Space Ace all the way. Tracks such as “Space Invader” dominate your speakers with groovy rhythms and snappy vocal passages that are reminiscent of Frehley’s early solo works. As the album progresses Ace continues to prove that even at the age of 63 he is still more than capable of bringing rock and roll to the masses. The track “Change” was probably my most favorite off the album as it features a really big sound complimented by one of the better solos I found on the record. Another notable track worth checking out was Ace’s rendition of the Steve Miller Band song “The Joker”. Even though I have heard countless covers of this song Frehley’s interpretation was fresh and fun making it a great summertime song to throw on at your next cook out. Both Kiss and Non-Kiss fans will want to check out this release as it’s a fun listen that has a little something for everyone. Ace Marrero is co-starring in the new film “Madison County”, directed by Eric England. Ace has worked with Eric on three projects now and no sight of slowing down. “Madison County” is premiering at this year’s Screamfest and is going to a real breakout film. Media Mikes had a chance to chat with Ace about the new film and what we can expect next. Mike Gencarelli: How did you become involved with both acting and producing the film? Ace Marrero: I had worked with Eric England on his college thesis film. I also worked with him on “Hostile Encounter”. Eric had been trying to get “Madison County” made and had a few different groups of investors involved at various times. After getting fed up with the way things were going Eric decided to take matters into his own hands. Eric wrote “Hostile Encounter” with me in mind to be in the film. It was done on a micro budget that was even smaller than what was budgeted for “Madison County”. We shot in Arkansas for a few days and then we did some shooting in Los Angeles as well. The DP on “Hostile Encounter” was really impressed with what Eric had done. He mentioned that he might be able to get some money together to do another film. Eric mentioned “Madison County” and after reading through the script Eric’s friend loved it and wanted to produce the film. He had one stipulation though and that was that I had to be in the film. I had also wanted to get into more of the producing side of things, so I just started helping out. I was setting up meetings and doing some other as well. Before I knew it I was a producer on the film. MG: Can you tell us about your character in the film? AM: I play the role of Kyle who is the brother of Brooke played by Joanna Sotomura. I go out with the group to kind of protect my sister from her ex-boyfriend. I don’t really fit in with the group so I am the outsider/protagonist. MG: What do you think was the most challenging part for you working on the film? AM: I would probably say juggling my roles as an actor and producer. First and for most I am an actor. I wanted to make sure I was doing a good job while at the same time keeping everything else going and making sure things were set for the next day. My producer role kind of over shadowed my acting role in the film and it made me forget a little that I also have a role in the film. MG: How was it working with the other cast members? AM: Nick Principe was great and we were really happy to have him be involved with the film. Eric had wanted Nick from the start to be part of the film and to play the killer. Nick also did the stunts for the film. He was great. Joanna was great as well! I have always been impressed with her work. Her part in “Madison County”, I think is really going to get her a lot of attention. MG: Can you tell us about another film you have been working on “Roadside”? AM: This is my third film with Eric England in 17 months. He is just a really great, young director. I think he just turned 22 or 23. Eric is incredible! The script for this film is really great. Eric actually completed it in I think a week and a half. I think it’s one of the best scripts I have ever read. I play the lead in the film and it’s an amazing role for me. This film is the type of thing I love to do. I think we are all going to take off from these films. We knocked “Madison County” out of the park but “Roadside” I feel is out of the field!